I was all, "Who the heck is Andrea Elson?" and quickly Googled her. 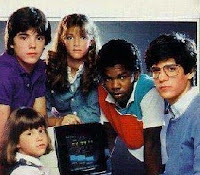 I was a big fan of Whiz Kids, a very short-lived show which ran between 1983-84. The show also starred Albert (Matthew Laborteaux) from Little House . Anyway, I guess I thought Andrea was super cool for whatever reason back then and sent her a fan letter while she was on ALF or Whiz Kids. I won't lie, I loved ALF. I wanted him to come live with my family. It's amazing how much I loved weirdo robotic and alien puppet-type characters such as E.T., Small Wonder V.I.C.I aka "Vicki" and ALF. In the late 1970s I loved Mork from Ork on Mork & Mindy. I'm sure there are lots of other examples, feel free to remind me of 'em in a comment. Based on a quick glance at her Filmography at IMDB, Andrea continued acting in bit parts throughout the early 1990s, but it looks as if ALF was her biggest role. The show ran for a total of only four seasons from 1986-1990. I must have been tuning in back in 1986, because by 1987 I was done writing letters to stars and had focused more on music than TV. In fact, I bet this signed photo was from her Whiz Kids days in 1984 because that was when I was sending out the bulk of my fan mail. PS I love that my blogging buddy Michael posts fun stuff about '80s movies and shows I enjoyed back then, only he's cleaver and tests his readers trivia knowledge! Check him out at: I Think It's Interesting. I loved Mork too. He was such an endearing alien. I never could stomach Alf, though. How about Rosie, the robot maid from the Jetsons?! She was awesome. This was another fun post, as always, Ally. Awesome! I wasn't never into anyone or anything long enough to right a fan letter. I loved Alf too. I have the first season on DVD. I probably would get more but I just haven't thought of it since I got the first season. Thanks for the reminder. I loved ALF. I used to have an ALF puzzle. I wish I still had it. ALF would not be allowed over my house, we have 8 cats. I love the 80's! Great post. Oh Sweet. Alf, god that takes me back. All of a sudden I remember his planet was melmac and he got drunk on cranberry juice. Whiz Kids ruled! I totally loved that show. I remember thinking they were so cutting technology back then. A giant computer that can record video onto a tape? Incredible. Alf too was at the top of my viewing list. I even saw the Alf TV movie when he (or it) was kidnapped by the government. And yes, I might've watched the Saturday morning show every now and again. "Hey Willie!" ALF was just so funny! We had a stuffed ALF doll. My parents still have him cause they are crazy like that! I was never much into ALF, never really understood the attraction of puppet shows outside of The Muppets. Did love Mork and another commenter here mentioned Rosie from the Jetsons, loved her and her sass. I also loved the robot on Lost in Space, (this is going to date me I know) but when I have seen reruns of Lost in Space - wow, some really bad production quality, makes ALF look like genius technology. Thank you so much for the shout out Ally! I can't believe she only had bit parts after she left 'Alf'.... One would assume that being on Alf would be like working at Disneyland, it always looks good on a resume. Time to go watch my favorite Melmacian! @Rawkn * @Aine Mork rocked! I don't think I was super down with the Jetsons. I watched the show but with animation it wasn't as real as the alien puppet type stuff. @Jerry I was just a weird kid, I wrote to dozens of stars. @PTM Alf puzzle? Too cool! @Ian you're such a dude! @Copyboy no way! I didn't think anyone out there knew Whiz Kids! Ha ha! @GirlNextDoor - I want that doll! Ha ha! That's awesome! @BlackasO - I would think she would too. No prob about the shout out! Just showin' some love! Whiz Kids! Wow...All at once all of these memories from that show kept flooding back in. They should re-airs these on Syfy or Nike at Nite. You know, for when they run their daily marathons. Always wondered what happened with Allison's career. Nice flashback post. I loved Whiz Kids and I LOOOVED ALF! Man you are are so lucky to have that signed autograph! :) I wish I had the guts to send stuff like that out to celebs when I was young. I remember thinking that I wanted to all the time, I just never did it!